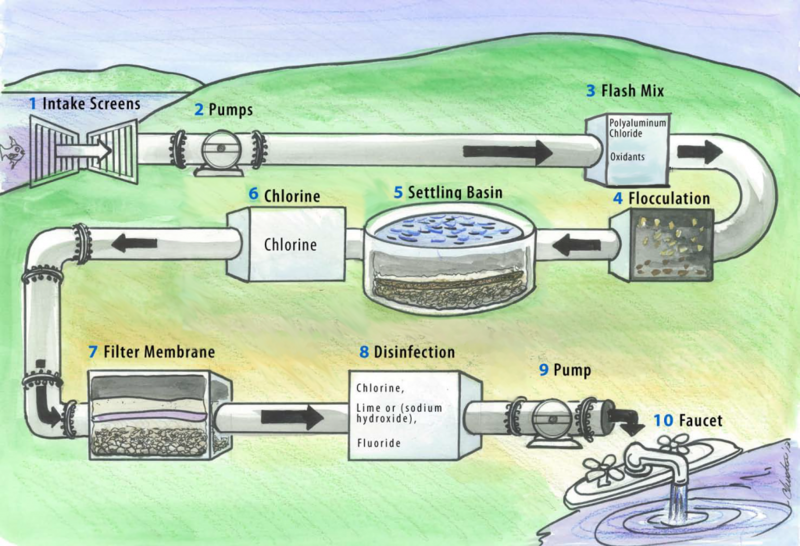 The diagram shows the process of the water treatment. The diagram illustrates the process by which surface water from places such as lakes reaches our faucet. Overall, the diagram indicates ten stages that clean, filter and disinfect the water to make it safe to use. To begin with, lake water passes through intake screens to remove any large pieces of waste that may block the pipe. After that, pumps push it on into a flash mix chamber where the additives Polyaluminium Chloride and oxidants are mixed with the water. Following that, the water passes through a fourth flocculation stage and on to a settling basin where it is allowed to sit for some time, so that gravity may cause contaminants as dirt and mud to settle. Once settling is complete, Chlorine is added to the water to further purify it, then passed on through a fine filter membrane which removes any remaining minor contaminants from the supply. Subsequently, the liquid is disinfected with three substances: Chlorine, Lime (or sodium hydroxide) and fluoride before finally being pumped to our homes and faucet. State the key activities of the ten stage process. Define surface water (as shown in the diagram) since freshwater may be obtained from several sources. Our goal is to explain a process so that someone who can neither see nor has any working knowledge of can understand. Therefore, it’s important to explain some of the key processes (such as the intake screens) to enable the reader to understand the general process. It’s not necessary to know all the names mentioned in the diagram, just the fact that these chemicals or additives are added into the water as part of a sequence. The name of each stage often tells you the key verbs used at that point. For instance, “Flash Mix” is a step at which mixing occurs. In the fourth stage, the flocculation stage, it’s unlikely that many people will understand that technical term. However, to settle means to rest or sit somewhere for a while, so we may use this information to explain what happens at that point. If you’re not sure of the purpose of a part of a process diagram, hedging language such as “likely” or “probably” can be used to show what the writer believes a stage is most likely for. If unsure about the function of stage 6, simply write that Chlorine is added at this stage before the water is pumped onwards to be filtered. At stage 7 and 8, nouns are used to describe the stage names. By turning these into verbs, it’s possible to describe the activities at these points. Therefore, disinfection becomes disinfect and filter stays as filter. The diagram illustrate the process by which surface water from places such as lakes reach our faucet. Overall, diagram indicate ten stages clean, filter and disinfect the water make it safe to use. To begin with, lake water pass through intake screen to remove any large pieces of waste that may block pipe. After that, pump push it on into flash mix chamber where the additives Polyaluminium Chloride and oxidant are mix with water. Following, the water passing through a fourth flocculation stage and on to settling basin where it is allowed to sit for some time, so that gravity may cause contaminant as dirt and mud to settle. Once settling is complete, Chlorine are added to the water to further purify it, then passed through fine filter membrane which remove any remaining minor contaminants from the supply. Subsequently, liquid is disinfected with three substances: Chlorine, Lime (or sodium hydroxide) and fluoride before finally being pumped to our home and faucet. Once settling is completed, Chlorine is added to the water to further purify it, then passed through a fine filter membrane which removes any remaining minor contaminants from the supply. Subsequently, the liquid is disinfected with three substances: Chlorine, Lime (or sodium hydroxide) and fluoride before finally being pumped to our homes and faucet.